Now your students are curious. They’ve realized the school network is slow, filtered, and will take longer to access with only a 15-minute lunch period. Perhaps they’ve discovered MyFi, softAP, and WiFi tethering applications that allow them to bypass your managed network and surf the Web without your controls in place. Even worse, since students are doing this on school property, you are responsible for their behavior. What’s an overworked CIO to do? 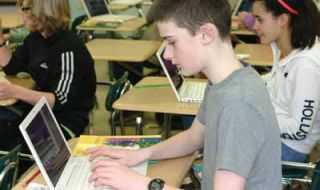 Prchlik uses Cisco-hosted controllers that allow him to manage access points and provide weekly reports to his schools. IT directors can use the reports to identify rogue networks within their environment. Carl Behmer, supervisor of technology and information for Paso Robles (CA) Joint Unified School District, agrees with Prchlik that districts need to have strict policies in place. “When you embrace BYOD , you are accepting its potential complications, such as wireless hotspots where students can MyFi off their phones. Legally, we can’t put cameras out there, and my district can’t afford equipment that searches for rogue devices every minute.” Instead, Behmer turns to his AUP. “If a kid is doing something wrong and is found out, the disciplinary committee has to deal with it.” Behmer points out that even if a district isn’t doing BYOD , students can try to use their own networks to connect. To make the school network more appealing, Karr’s district became less stringent about filtering while remaining CIPA-compliant. Karr runs four 5800-series controllers that handle 500 access points apiece. He relies on Cisco and AirWatch to help him manage his 1,600 access points throughout the district. Andrew Wallace, director of technology at South Portland (ME) Schools, found out about BYON when a teacher couldn’t print but could get to unfiltered websites. Wallace quickly realized the teacher had inadvertently connected to a student-created rogue WiFi hotspot. “As more and more wireless providers allow for tethered Internet access via a cell data plan and students become more savvy at jailbreaking smartphones, this is something schools will need to be keenly aware of and develop policies around,” he says. For Wallace, the key is to make your wireless network so robust that students don’t want to go off on their own. He suggests that districts invest in the fastest Internet speed possible and come up with incentives to keep students on your district’s network. Wallace asked teachers and librarians to curate high-quality videos from YouTube and other sources and made them available on intranet. He’s also investigating background computer scripts that would be installed on student machines. The scripts would periodically check that the computer was on the school’s network (if in the district) and would default to the school network if the machine was not already on it. Centralized management is an important first step in getting control of BYON . These companies make products that can help you do that. Mobile device management (MDM) products lets you manage and support all of the mobile devices throughout your buildings. It makes it easier to distribute apps, data, and configuration settings. Here are some companies that offer MDM solutions. ■ Mobile Learning in Today’s Schools, an information guide from Lightspeed Systems. Download at www.lightspeedsystems.com/guide-to-mobile-learning. ■ Bring Your Own Network, a white paper from iPass, describes how a BYOD strategy can enhance productivity. Download at info.ipass.com/forms/bring-your-own-network.